This arrowhead was one of many found at Urqhuart Castle near Drumnadrochit. Dating from the 14th or 15th century, it would have been used for hunting. The surviving ironwork from Urqhuart Castle is quite varied, consisting of horse equipment, tools, weapons, hunting equipment, and domestic material. A wide range of arrowheads of different forms were found, dating from the 13th through 17th century (several are illustrated on the SCRAN website). Some were used for military use, as would be expected at the castle, but a number like this one were for hunting. Documentary sources record that King David II came in the summer of 1342 and stayed at the castle specially to go hunting. A wide variety of finds have been uncovered in excavations at Urquhart Castle. They include weapons, but also objects such as ewers, pottery, brooches and gaming pieces, showing the civilian side to life in the castle, with men and women living there. 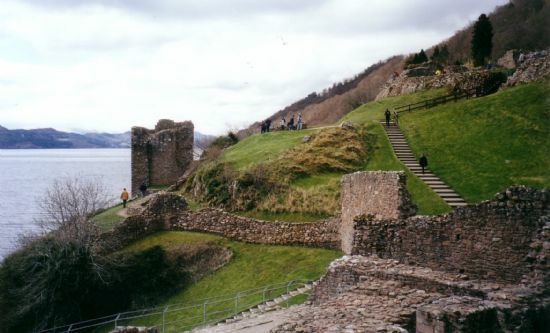 The site of Urquhart Castle has a long history. Bronze Age metalwork including a blade and axehead have been found on the site. Recent excavations found remains of a burnt mound at the north end of the site, probably used for cooking in prehistoric times. It was hillfort in Iron Age times, and like many of the period shows evidence of vitrification – where a fire burned so fiercely that it melted some of the rock. This prehistoric fort was also used in Pictish times, if the find of a fragment of a Pictish brooch does indeed come from the site. In medieval times, the castle was occupied from the 13th century, showing a progression from a keep on a the motte-like mound, with a double bailey added within stone enclosure walls in the 13th century. There is evidence of many rebuildings in its long period of use. Recent excavations for the construction of the new car park revealed evidence of a timber building and smithy in this area of the site. The castle was blown up in 1692 after the 1689 Jacobite rising. Meldrum, Edward 1975. ‘Mediaeval Castles and Towerhouses,’ in The Hub of the Highlands: The book of Inverness and District, Inverness Field Club. Samson, Ross 1982. ‘Finds from Urquhart Castle in the National Museum, Edinburgh,’ Proceedings of the Society of Antiquaries of Scotland 112, pp. 465-76. Alcock, Leslie & Elizabeth E 1992. ‘Reconnaissance excavations on Early Historic fortifications and other royal sites in Scotland, 1974-84; 5...’, Proceedings of the Society of Antiquaries of Scotland 122, pp. 242-67. Batey, Colleen E. ‘A copper alloy pin from Urquhart Castle, Inverness-shire,’ Proceedings of the Society of Antiquaries of Scotland 122, pp. 351-3. Bridgland, Nick 2005. Urquhart Castle and the Great Glen. Historic Scotland publication.